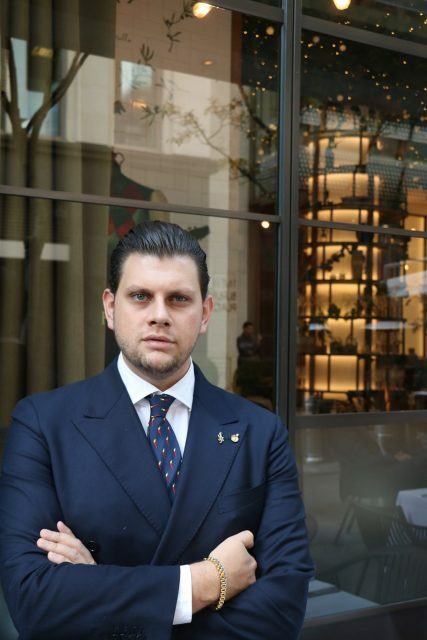 Fabrizio De Fenzo, head sommelier at Restaurant Frescobaldi, was born in Naples and knew from a very young age that he wanted to work in the hospitality sector. At the age of just 14 he joined a catering school and trained to become a bartender, but was later introduced to the world of wine, at 16, and changed tack, setting out on the path to becoming a sommelier. Having studied with the Italian Sommeliers Association (AIS) and taking part in several junior sommelier competitions, organised by the AIS together with the schools around Italy, de Fenzo placed 6th in the National Best Junior Sommelier at the age of 18. A year later he took part in the Regional Competition and placed 2nd. Swiftly after finishing high school, de Fenzo set his sights on London, first working at L’Anima Restaurant in Liverpool Street as a commis sommelier, supported by mentor chef Francesco Mazzei. Having worked his way up to assistant head sommelier, he moved to Sartoria on Saville Row in Mayfair, during which time he took part in the Best UK Sommelier Competition and placed 7th. He later took up a position at the Michelin-starred Petrus by Gordon Ramsey in Knightsbridge, before becoming head sommelier at Ristorante Frescobaldi in Mayfair last November. What or who inspired you to become a sommelier? My inspiration was and is my father that share my same passion, he doesn’t do it as profession but is very professional and we have a lot of fun together trying new wines and comparing different ones. He was the one who pushed me in a good way to go for the courses and so I did and I loved it from the very beginning. We are from Naples, a region full of different grape varieties, so there is a lot to learn. When I came in London I begun to truly understand the job and the role of the Sommelier in a restaurant, thanks to people around me that played a very important role in my career like the chef Francesco Mazzei. My favourite part of the job is being in contact with people and let them enjoy with a trip of sense through the wine glass, but what I also love is to create a wine list with unique products and peculiars wines. What’s the biggest misconception about the role of a sommelier? The biggest of all is think that the sommelier role is a lazy job and thinking that you are there just there to open a bottle of wine. It depends, I may have a bottle of red, or some white but some time I also have a bottle of bubbles. Study more, never forget what your mentors tell you, and drink more to add to your knowledge. There is not one in particular, anyway I think if I have to relate a wine to my very begin in the wine is a bottle of Biancolella Frassitelli by Casa d’Ambra from Ischia. What to date has been your most memorable wine experience? The most memorable has been when I tried “La Tâche Monopole 1969, DRC”, but there are many others, like the wine trips, in Champagne, in Tuscany, the Vinitaly, first bottle of Echezeaux sold, first Masseto 2001 opened, omg! The one that annoys me more is the fact that they want to order the wine to any person walking in the restaurant thinking that the role of the sommelier doesn’t exist at all. Also here I have to repeat myself a little bit, my mother and father have a very important role on my gastronomic point of view, than Francesco Mazzei plays a very important role in this area, teaching me how to eat very good food not just creating dishes but also giving a twist to mom’s recipes with chef’s hands. My wine fantasy take place in Naples, with my own vineyard with autochthon grape varieties, to let people understand the terroir and the power that my region has. If you weren’t a sommelier, what would you be doing and why? I really don’t know, I started when I was 16, so I had already in mind what to do in my life. Prosecco for me is a very difficult wine to drink, I struggle to find one that suits my taste and keep the philosophy of good growing and respecting the ambience. Who is the most memorable customer you’ve ever served and why? There are many, one of the most memorable one is a gentleman that gave me a bottle of Chateau d’Yquem 1961 after I came back from a bad injury. Or another one is a guy who drunk a double magnum of Ornellaia 2001. What makes you most proud to be a sommelier working in London? The best one is that you can sell every single wine to anyone, there are so many costumer to ply with that you have multiple chances to sell what you want. This is an hard one, I have so may wines that I want to try I am still so ignorant, Les Jardin de Babylone, Jurancon, Didier Dagueneau, Taurasi Poliohemo, Luigi Tecce, Meursault Coche-Dury and many others. What is your wine philosophy at Frescobaldi? I work with a wine list that is 80% Frescobaldi’s wines and the rest is a bit of France and Italy. The philosophy is to give the costumer an experience and trip through the glass, and so you bring them exactly in the land of Italians Wines with our wines and food. I am working to improve the wine list, and add to it unique wines to give a good memory to my clientele. Finally, what wine and paired plate would you pick from your list and why? The paccheri with burrata and nduja with a smooth red of ours like Serre Nuove dell’Ornellaia that we also do by the glass.